In a recent ceremony, Triangle Equities celebrated the launch of sales at a luxury townhouse development known as Kensington Estates. 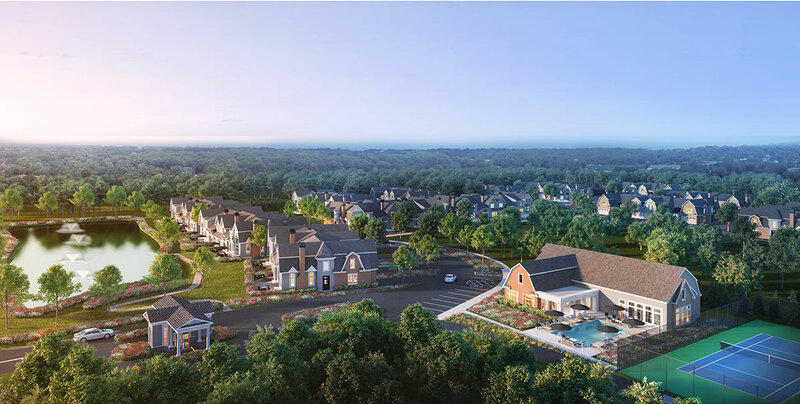 Located in Woodbury, Long Island, the new community is exclusively available to adults 55-and-over and is expected to debut in 2020. New plans have been revealed for an industrial and air-cargo facility in the South Ozone Park area of Queens. New York-based developer Triangle Equities acquired the property, located at 130-24 South Conduit Avenue, for a total of $25.4 million in early 2018. Now that phase one of St. George’s Lighthouse Point project – a 12-story, 116-unit mixed-use building with residential units and commercial space at 35A Bay Street – is under construction and gaining attention, Triangle Equities is shifting focus on to the second phase. 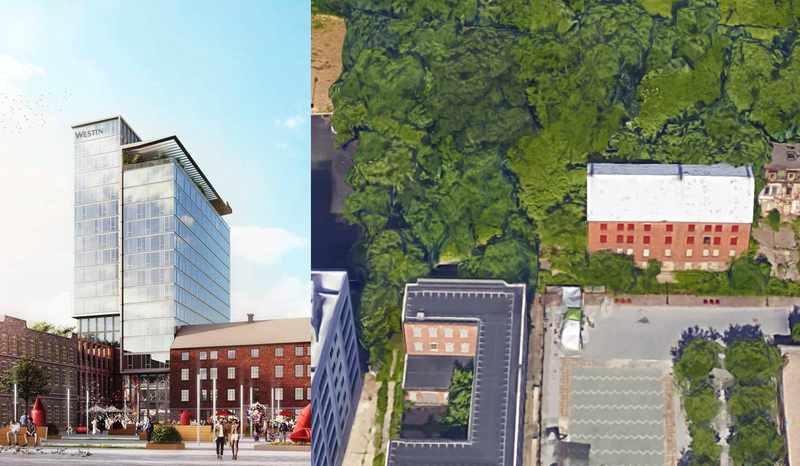 The developer has partnered with Starwood Hotel & Resorts for a 12-story, 175-key Westin hotel, which will be built adjacent and connected to one of four existing industrial buildings, the Wall Street Journal reported. The hotel, dubbed the Westin New York Staten Island, will encompass 190,000 square feet and will include 15,000 square feet of event space. Many of its luxury amenities and a restaurant will be located in the industrial building. The other three industrial buildings will be redeveloped into an additional 30,000 square feet of mixed-use commercial space. Perkins Eastman is designing and Andres Escobar is responsible for the interiors, although new building applications haven’t been filed for the hotel. Completion of the hotel is expected in 2019. In the summer of 2015, YIMBY brought you new renderings of the Lighthouse Point mixed-use development, in St. George, located immeadiately south of the St. George Terminal on Staten Island. Construction kicked off on the project’s first phase later that year – a 12-story, 116-unit mixed-use building that fronts Bay Street. Its developers – Triangle Equities and Lubert-Adler – have now secured a total $81.7 million in financing from multiple sources. In addition, Commercial Observer reports Regus signed a lease to take 30,000 square feet of the mixed-use building’s 65,000 square feet of commercial space. The remaining 35,000 square feet could be leased as office or retail space, and construction on the first phase is expected to wrap up in 2017. 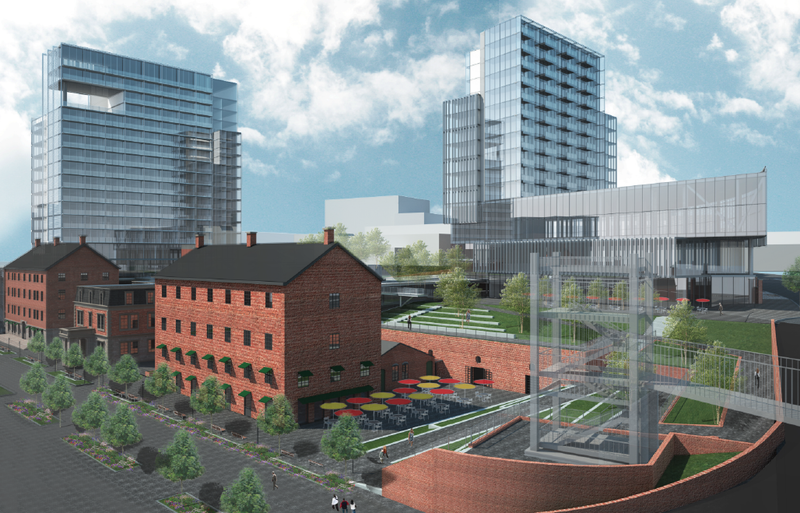 The rest of the project includes repurposing four historic structures and other artifacts, and building a 12-story, 175-key hotel with 15,000 square feet of event space and an additional 23,000 square feet of multi-use commercial space. Garrison Architects is designing. Last year, YIMBY revealed the two-story, 88,000 square-foot Triangle Plaza Hub planned at 459 East 149th Street, in South Bronx. Now the commercial and community building is close to being fully leased, according to the Daily News. The building is expected to open this upcoming fall, and tenants include Brightpoint Health, DaVita Dialysis Center, Vistasite Eye Care, Fine Fare Supermarket, Metropolitan College of New York and Boston Market. Triangle Equities is developing, and S9 Architecture is designing.